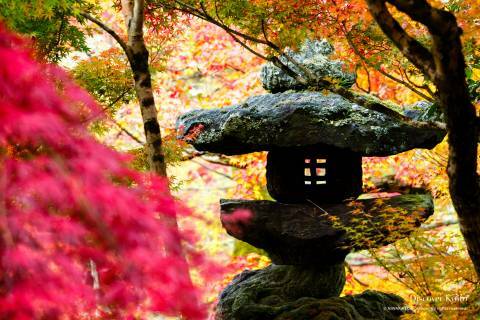 A Pure Land Buddhist temple near the large Nanzen-ji complex, Eikan-dō is most famous for its autumn foliage and the light-up event it hosts in late fall. Founded back in 853 by a disciple of the famous monk Kūkai, this temple was a place of learning that nurtured the Pure Land sect it now belongs to. 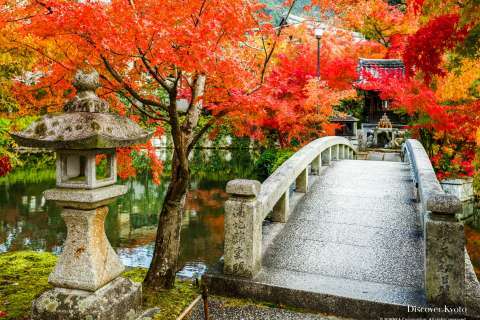 With gardens dominated by maples, the grounds of this temple are alternatively bright with fresh greens or brilliant reds, with countless people arriving in pilgrimage during the peak season. Built up against the Higashiyama foothills, a two-story tahōtō pagoda offers a great view of the city and precincts, and the covered stairs winding up to it are architecturally fascinating. Numerous halls are likewise connected by covered walkway, and Eikan-dō is also known for its Mikaeri Amida, a statue of Amida Buddha with his face turned to look over his shoulder. 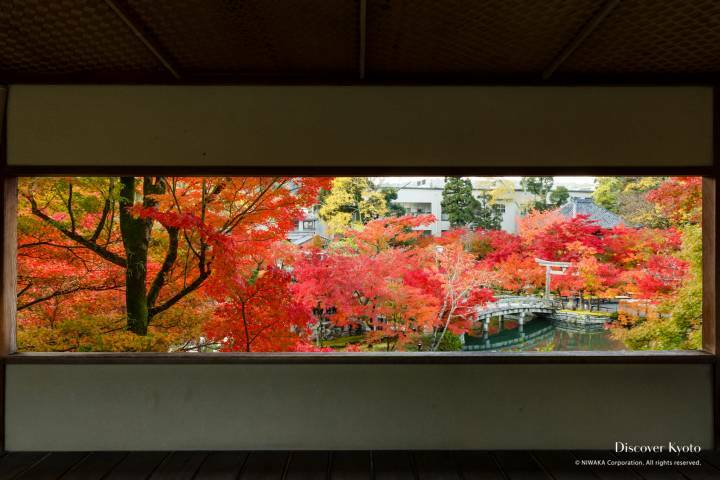 Whether you attend during the day or the special night illuminations, Eikan-dō isn't likely to disappoint. 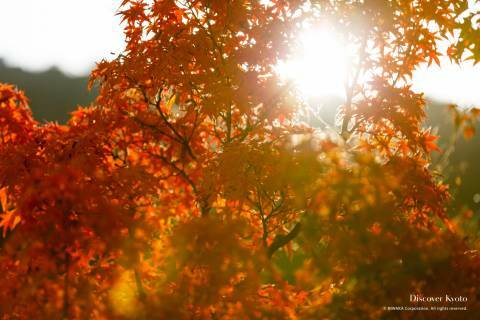 Eikan-dō is most famous for its autumn foliage and the light-up event it hosts in late fall. 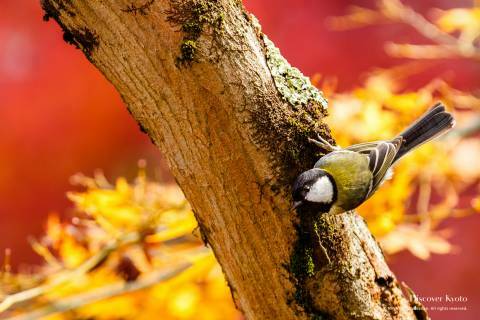 Thanks to its garden, by far the most well-known aspect of Eikan-dō is its amazing autumn scenery. 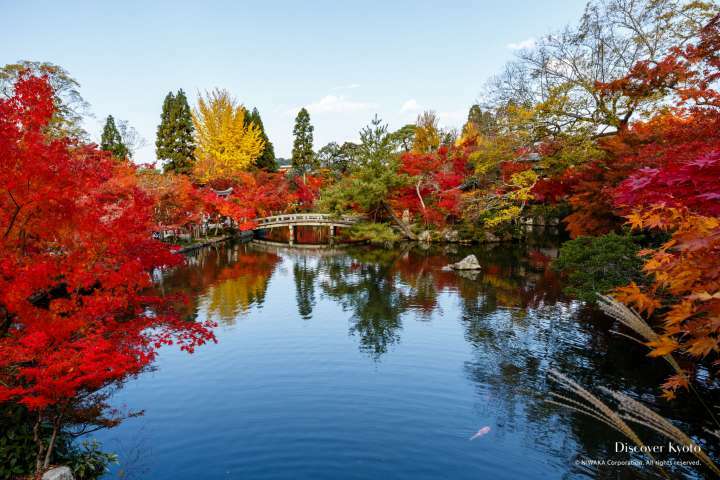 Sprawled across several levels in the foothills of the Higashiyama mountains, the large and open gardens are comprised primarily of maple trees that turn splendid shades of orange and red come November. 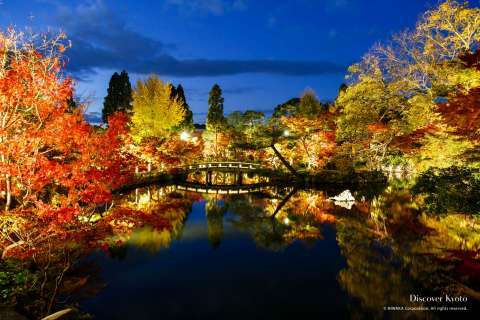 Eikan-dō’s fall color illumination is one of the most famous in the city, and for a set period each year visitors can enter the temple at night to enjoy the warm colors lit up against the dark sky. Though most statues depict the Buddha Amitabha looking straight ahead, the statue at Eikan-dō depicts the deity looking over his shoulder behind him. The story goes that this statue originally did face forward, languishing in a storehouse until it was brought to Kyoto by Yōkan, who later became the seventh Chief Priest of Eikan-dō. In 1082 when the Chief Priest was getting on in age he was walking around the statue and ritually chanting sutra when the statue suddenly alighted from its dais to lead the monks in his walk. Shocked, Yōkan stopped walking until Amitabha looked back over his shoulder and noted how slow the priest was going. Legend has it that this Important Cultural Property has been looking over its shoulder to care for those who might be falling behind ever since. The history of Eikan-dō began with Shinjō (797–873), a disciple of the famous monk Kukai, known posthumously as Kōbō Daishi. Desiring to found a temple to worship the five Wisdom Kings, Shinshō purchased land from the aristocrat Fujiwara no Sekio in 853. 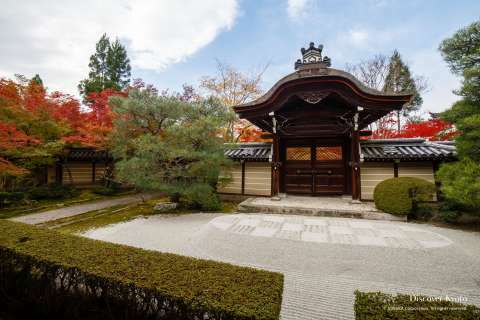 However, at that time it was still prohibited to build temples in Kyoto proper, as the capital had been moved from Nara to Kyoto precisely to avoid the influence of powerful temples on politics. The temple’s status remained in limbo for the next ten years until Emperor Seiwa granted permission and Zenrin-ji was officially founded. 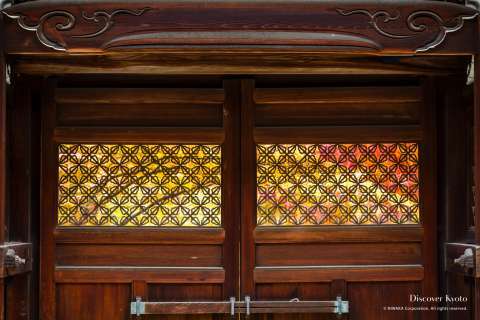 Though it is more commonly known by the names Eikan-dō or Zenrin-ji, its official name is Shojuraigō-san Muryoju-in Zenrin-ji. 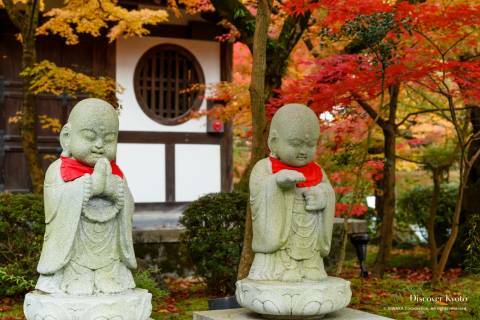 In the beginning, Eikandō-do was an esoteric Shingon temple in keeping with Kukai’s teachings, but gradually transitioned to Pure Land Buddhism as the popular sect gained prominence in the capital. In the beginning of the Kamakura period, the monk Jōhen studied the books of Hōnen, the founder of Pure Land Buddhism, in order to critique the new religion. However, he ended up converting to Pure Land practices himself, and after Hōnen’s period as the 11th Head Priest Jōhen followed as the 12th. One of Hōnen’s other disciples, Shoku (1177-1247), followed as Head Priest after that, continuing to teach Pure Land Buddhism. From the leadership of the Shoku’s disciple, Jō’on, Eikan-dō became the head temple of the Seizan branch of the Pure Land School. Since then the temple has served as a training site for the Seizan branch. Like many temples, Eikan-dō was completed razed during the Ōnin War (1467-1477), and it took generations of priests until the 16th century to see the temple rebuilt. However, Eikan-dō faced further troubles during the Meiji Period under the policy of State Shinto which promoted the indigenous religion over Buddhism. Despite the hardships in their history, nowadays the temple is doing well and continuing to promote Pure Land teachings in Kyoto.